"The island Britain is 800 miles long, and 200 miles broad. And there are in the island five nations; English, Welsh (or British), Scottish, Pictish, and Latin. The first inhabitants were the Britons, who came from Armenia [misspelt, but now called Brittany, France], and first peopled Britain southward. Then happened it, that the Picts came south from Scythia, with long ships, not many; and, landing first in the northern part of Ireland, they told the Scots that they must dwell there. But they would not give them leave; for the Scots told them that they could not all dwell there together; "But," said the Scots, "we can nevertheless give you advice. We know another island here to the east. There you may dwell, if you will; and whosoever withstandeth you, we will assist you, that you may gain it." Then went the Picts and entered this land northward. Southward the Britons possessed it, as we before said. And the Picts obtained wives of the Scots, on condition that they chose their kings always on the female side; which they have continued to do, so long since. And it happened, in the run of years, that some party of Scots went from Ireland into Britain, and acquired some portion of this land. Their leader was called Reoda, from whom they are named Dalreodi (or Dalreathians)." Little is known of our first British ancestors, but evidence of human stone-age occupation in Pakefield, Suffolk, goes back 700,000 years. This great age is not so surprising in the light of the ancient building discovered at Chichibu, near Tokyo Japan. That hut is c500,000-years old and was apparently built by Homo erectus. Since Japan was then already an island the discovery suggests further sea travel to the Americas was also possible. Evidence has also been obtained in the Czech Republic, which confirms that cloth has been woven for 27,000 years. There were apparently several attempts to settle in Britain (including one by Neanderthals c60,000-years ago near Norwich), that failed apparently due to climate changes and advancing ice, prior to final success c12,000-years ago. However, about 80% of Britons' genes come from the hunter-gatherers who arrived immediately after the last Ice Age. These nomads walked in, crossing a land bridge to France and the Rhine and other rivers. Apparently Britain began to separate from the continent c600,000-years ago and the English Channel was likely cut c200,000-years ago as a warming ice sheet melted. Although difficult to cross the great rivers, migration would still have been possible until the last Ice Age ice-sheets melted c10,000-years ago. Perhaps a few thousand people followed herds of reindeer, or wild horses northward into Britain as the climate warmed. These nomads were later cut off as rising sea levels isolated Britain from mainland Europe. The cultural influence of these people is questionable, although river names such as Thames, Tamar, Severn, Tyne are now attributed to these, our earliest British ancestors. Actual fossils of humans are very rare in Britain, but evidence of human occupation is scattered over the landscape, preserved in ancient river deposits, and stored in caves, in the form of stone tools and animal bones. Fossil remains can tell scientists what the people looked like; stone tools can reveal details of their behaviour and adaptations; while associated sediments and animal remains can be analysed to unlock the secrets of ancient climates and environments. Although there is no agreement on the physical appearance of these first Britons, they may have been tall and blonde in the south of England, tall and dark in Northumbria and southern Scotland, and short and dark in north Wales. The most visible British genetic marker is red hair and Tacitus noted the Romans' surprise at the extent of red hair 2,000 years ago. [8A] Recent studies have shown that there is more red hair in Scotland and Wales than anywhere else in the world. Apparently red hair is a mutation that occurred between probably 8,000-10,000 years ago. The first identified visitor to have carved the rock at Hunterheugh was a Mesolithic hunter, who left a stubby flint end-scraper similar to tools from a Mesolithic site at Howick 14 km away, which was dated to around 8,000 BC. The Hunterheugh scraper was found in topsoil close to carvings in the Fellsandstone escarpment 7 km north west of Alnwick and 14 km from the coast. At one of four cup and ring marked rocks on Hunterheugh Crags in March 2004, the carvings were dated to the Early Neolithic (spanning about 3900-3500 BC) at one end through to the Early Bronze Age at the other. Some British scientists study how diet changed in Britain during the Mesolithic period (9,000 to 5,200 years ago): the ensuing Neolithic period (5,200 to 4,500 years ago) is the last phase of the Stone Age. Farming arrived in the British Iles around 4,000 BC and spread quickly during the Neolithic period. The main questions concerning the speed of change relate to how quickly Mesolithic peoples adapted to new farming methods, and the rate of spread of farming in Britain by new farming communities. Recent research tracks the shift in diet by examining the dietary signature stored in the bones. Apparently the diet-shift was rapid and complete at the onset of the Neolithic period. "Marine foods, for whatever reason, seem to have been comprehensively abandoned," the researchers concluded. By 8,500 BC, Mesolithic people had made their way to Britain from Spain and France, bringing fire and domestic animals. By 4000 BC, pottery, large stone tombs, domesticated plants and animals were all present in Britain. When cattle, sheep, pigs, and wheat arrived about 5,000 years ago, fish quickly fell off the Neolithic menu. These immigrants from Spain probably built and used the large stone tombs found in Scotland. They eventually merged with later immigrants from northern Europe who are known from their coloured, geometrically-patterned pottery found in their graves as 'the Beaker people' and the inter-marriage created the pre-Celtic people of the British Isles. (The Beaker people are thought to have arrived c2200 BC, and to have added concentric circles at stonehenge for their sun worship. In fact, many Northumbrian cist graves have been found with Beaker pots inside them, suggesting that many of these monuments go back earlier still to the centuries around 2,500 BC.) The proof of this migration is found in the spiral pattern grooves cut into the rocks and boulders in Spain, France, Scotland and Ireland. 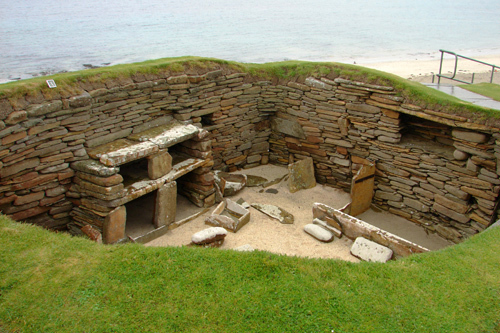 The design of burial chambers located in the Orkney Islands also provide an important link pointing to Spain. Farming arrived in the Orkney Islands c4,000 BC and as it replaced a nomadic way of life, the Orkney Islands became a fortress with its many stone settlements. From recent excavations, it seems that these Orkney Islanders were a slim, swarthy Caucasian race, with long, narrow heads. Whatever they looked like, they built with the only material available - stone. Their houses, and forts were semi-underground to give protection from the strong, cold, arctic winds. The Orkneys are a particularly rich area for fishing because of the collision between the Mexican Gulf stream and the colder arctic waters. Evidently the Picts were in the Orkneys because their arrangements of standing stones are found throughout the Highlands and in the Islands. You can see the curving line in the example and the presumption is that these stones were also used like their southern equivalents to keep track of time. Presumably the stones were carefully aligned to track the height of the sun and determine the change of seasons for planting, harvest, religious festivals, etc. Modern analysis of Stonehenge and similar sites in Central America and Egypt has shown the relationship between careful alignment of side-angles and star, moon, and especially sun movements. Stonehenge may have additionally tracked the moon. The Romans were well aware of the early Orkney Islanders who had developed a fierce warrior reputation and were feared for the strength of their navy. By the time Rome became a world empire, the Orkney Islanders were recognized by Rome as a significant sea power. Clearly these people had developed sailing skills to maintain a livelihood, extended those skills for trade, and then developed the capacity to protect their new wealth. The first records we have of Britain are Greek, apparently from the Greek colony at Massilia (Marseilles). An unnamed sailor apparently named Britain Albion in c550 BC. In c250 BC anoter Greek sailor, Pyhtias, sailed around Britain in c250 BC. Pyhias named the islands the 'Pretannic' Isles, probably after the Celtic word Pretanni, which means 'people who paint themselves': the name Britain is presumbly derived from the Celtic Pretanni. The Celtic warriors often fought naked with their bodies painted with dyes, traditionally thought to have been wode, but now thought more often to have been derived from copper deposites. Much of the evidence used to trace and identify the early Britons is in their stone markers and carvings. Spiral grooves cut in the rocks marked the immigration from Iberia. Similarly, the Picts left more complex, enigmatic carvings with specific designs of people, symbols, animals, and shapes. As illustrated in the accompanying pictures some stone carvings are quite beautiful and no doubt had meanings for the local people. Their meaning, however, is now hidden. The stones were usually upright and may have been markers, or territorial statements of ownership or identity. These stone monuments took considerable time and effort to create and their purpose was clearly more than mere graffiti, but whatever their purpose was it is now unknown. The first discovered and best-known Bronze Age carvings at Stonehenge are the dagger and axehead found by Richard Atkinson in 1953, on the inner face of Stone 53, one of the imposing Trilithon sarsen stones. 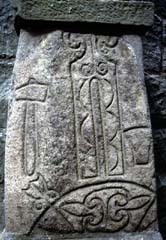 Therer are about 13 other axes on the same stone. Approximately 26 axes have been claimed on the outer face of sarsen stone 4, and three on the outer face of stone 3, both in the stone circle. Known axes vary from 8 to 36 cm long. What did the Stonehenge carvings mean? The axes are almost certainly crude representations of contemporary Bronze Age metal flanged axeheads. The dagger could be compared to examples found in the nearby Bush Barrow. Here an apparently powerful man was buried with an exceptionally rich group of artefacts, including three copper or bronze daggers and an axehead. We must remember that while the sarsens are thought to have been erected around 2300 BC, metal axes were not in common circulation for generations after this. Whatever the carvings mean, accurate recording is vital to the understanding of the monument as a whole. More than 90 henges still exist in Great Britain. Construction of the great megalith circles such as Stonehenge and the larger Avebury were probably begun c3000 BC as circular earthworks - clearly before the Celts and their druid priests. 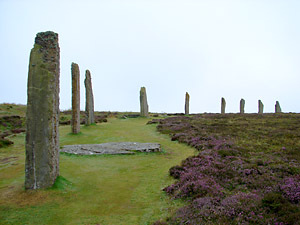 The stone circles were built about the same time as the arrival of the Beaker people from Northern and Central Europe. Presumably these Beaker People added the megaliths and moreover did that for sun worship. There is also evidence that both the people and the large stones came from Wales. One of the primary purpose of many of these henges appears to have been to identify the winter and summer solstices for farming. These newcomers were of a different ethnic group from the Iberian emigres in northern Britain, as their skulls were much broader and round. Evidence of contact between these new people and their continental ancestors have been discovered in several excavations, and seem to indicate a flourishing trade between northern Britain and Europe. Inter-marriage by these two groups probably resulted in the creation of the pre-Celtic people eventually called Picts by the Roman and Cruithne by the Celts. It seems that Stonehenge on the Salisbury Plain had been used from c4000 BC as a ceremonial site by native Britons. However, as well as the monument some 250 burial sites have been identified in the immediate area and many of those ecavated and radiocarbon dated. Archaeological findings suggest that the initial Stonehenge structure was built by ancient tribal chiefs in c3000 BC and then used as a cemetery for their ruling dynasty for the next 500 years. The earliest cremation burial site is dated to about the same time as the Stonehenge monument construction. Interestingly, detailed study of the stones themselves has revealed possible carvings of human faces. With the passage of time the rock has weathered and thus the 'faces' are faint and may be mere 'tricks of the eye'. However, archaeologist claims of such faces have been reported from Stone Henge and also Callanish - in Scotland. An additional Bronze Age circle of oak posts was discovered on the Norfolk coast and termed 'Seahenge'. It has been determined that the central stump was cut in 2050 BC and that the site was probably used as a religious temple. It is thought timber circles were used by prehistoric cultures to expose their dead to the elements, birds and wild animals - a practice called excarnation. The belief was that allowing the flesh to rot from the bones in the open air would liberate the dead person's spirit. Archaeologists say the find is unique in Britain, and the best preserved example in Europe. Because the first historical reference to the Picts only appears in 297, when the Picts were called enemies of Rome with the Hiberni (Irish), Scotii (Scots), and Saxones (Saxons), many historians assume that the Picts were simply another Celtic tribe. Although they inter-bred with the Celts, the majority of the Picts were probably the earlier, pre-Celtic people of northern Britain. They were a collection of tribes, headed by a warrior aristocracy which was by nature mobile. The Picts take their name in their own language from their painted bodies; this is because, using sharp iron tools and ink, they were marked by tattoos of various shapes. According to Pict legend, there was a Pict king named Cruithne, son of Cing. Cruithne supposedly reigned 100 years. Cruithne had seven sons called Fib, Fidach, Foclaid (or Fotla), Fortrenn (Fortriu), Caitt (or Cat), Ce and Circenn (Circind). The names of Cruithne's seven sons were also equated to the seven provinces of Pictland detailed in an account (possibly 14th century) of Scotland called De Situ Albanie . Argyll, which by the fifth century had been invaded by the Gaelic Scotti, is not listed as a Pictish province. The modern Fife is derived from Fib and Caithness from Cat. Cruidne (or rather Cruithne) is now the Gaelic for `Pict'. The term Picti was the Latinised version of the Picts own collective name. In old Norse the name is 'Pettr', in Old English 'Peohta' and in Old Scots 'Pecht'. Today in Fife or Aberdeenshire they are still referred to as 'Pechs' or 'Pechties', suggesting Pect instead of Pict. From c550-697 AD the Picts combined into two kingdoms: the Northern Picts in Caithness (with a capital at Inverness), and the Southern, whose capital was at Scone. In 697, the two Pict kingdoms combined to form a united Pictland. The Picts were defeated by the Vikings in 839 and then inter-married with the Dal Riadans to form Scotland in 850, with the capital at Scone. Pictish lands were basically north of the Forth-Clyde line, and north of the later Roman Antonine Wall. Roman pacification, and then Celtic and Saxon migrations erased any Pict claim to people or land south of the wall. In the west, the Picts were pushed out of Argyll by the arrival of the Scots of Dalriada c400, although there is a Pict standing stone near the Campbell Inveraray castle. In the north, Pictish influence covered the islands and stones have been found in nearly all of them. After the Romans left, the Picts' fought invasions by the Scots in the west, the Britons and Angles in the south and the Vikings in the north. In the seventh century the Scots pushed north, and a Celtic army came within a half-day march of the Pict's capital of Inverness. In the south, the Angles held Pict land for thirty years before being sent south by a rare, united Pictish army. The Romans often defeated the Picts in battle, but they never conquered them or held their lands. In c82 AD at the Battle of Mons Grampius, the Roman general Agricola slaughtered an army led by the Pict chieftan Calgacus, Tacitus was an eye witness and said that the Caledonii (Picts) lost 10,000 and may have only killed 340 Romans. (Of course, Tacitus's report may have been exaggerated for domestic Roman consumption.) The Picts who fought Agricola were apparently tall and fair-headed, but they also met a new tribe 'swarthy like the Iberians'. Agricola's victory did not last after he left for Rome to help fight off the Germans. When the legions withdrew the Picts destroyed their forts. The Greeks and Romans knew of a tribe called the Keltoi, but also called all people who looked or behaved the same Keltoi, regardless of the true name of the individual tribal group. (The Romans called them Gauls.) Over time the name was shortened to Celt. The ethnic group that we now call Celt were in fact an Indo-European, nomadic people, grouped in tribes, whose culture spread from Eastern Europe to Iberia. They may have spread over Asia as far as the borders of China. They were sometimes described as as fair headed (some Celts dyed their hair with lye), tall, fierce warriors by the Greeks. As a warrior culture, it was a Celtic army which nearly destroyed Rome in her early days and made themselves enemies of Rome. The Celts introduced soap to the Greeks and Romans; they gave the basic shape to tools still in use to this day: the handsaw, chisel, file, and other tools; the Celts developed the seamless iron rim for chariots; their chariot wheels were 4'8" apart, a standard that is today shown on the gauge of our railroads; the Celts pioneered the iron plowshare, the rotary flour mill, a rotary reaper, and horseshoes. Celtic art is interesting because it was abstract. The Celts left us their culture, and in the Dark Ages it was the Celts who preserved the enlightenment, the arts and Christianity. Many of the place names used today in Europe come from the names of Celtic tribes. Paris is named for the Parisii, Rheims comes from the Remi. Helvetia, the official name of Switzerland, comes from the Helvetii. Belgium is named from the Belgae. The Boii left variation of their names in Bologna and Bohemia. The Gauls left their name in: Galicia, Spain; Nuevo Galicia in Nueva Espana (modern Mexico); Galicia, Poland; and Galatia, Turkey. Saint Paul addressed an epistle to the Galatians of Turkey. Beginning c650 BC a series of invasions by iron-age, Celtic tribes brought a higher civilization to Britain. These people quickly dominated the more pastoral bronze-age natives. Perhaps the most advanced of these newcomers were the Belgae who arrived c90 BC. They settled in the southeast, and brought chariots, coinage, urban towns, and an aristocracy with them. Gaius Julius Caesar landed with two legions in 55BC, near Dover. Britain's isolation was about to end. (It hadn't actually been isolated as there had been a constant exchange with continental Celts.) The Britannic Celts encountered by the Romans were usually described as dark haired and short. Caesar's first adventure with the British Celts was a disaster: The Britons attacked, the Roman cavalry did not arrive, some ships were wrecked by storm, and the legionaries (who had to repair their ships) were confined to a beachhead. In 54 BC, a five-legion Roman expedition penetrated along the Thames. Here Caesar retrieved his reputation and met Cassivellaunus, who was defeated by Roman discipline - and cavalry - which coped with his chariots. Having achieved his minimal aim, Caesar left again at the end of summer. The Britons who met Caesar were tribal Celts who were tied by similar language, religion, and culture. These Britons were warriors, living for battle and plunder. The Celts had brought iron and iron had brought trade and fostered tribal independence. 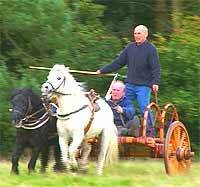 One of the Celts' innovations was the iron plough. The Celtic arrival in Britain also coincided with an increase in hill forts, but either native Britons, or the Celts may have built them. The Celts went to Britain because the land was rich and largely empty, whereas there was a growing continental population creating increased competition. Major Celtic tribal areas are shown above. Belgic tribes are shown on a white background. Celts had invaded Pictish areas in Scotland and those off the map included: Creones, Vacomagi, Taezali, Carnonacae, Decantae, Carenei, Smertae, Lugi, and the Cornovii. The Celtic tribe (tuath) was ruled by a king (ri) through a general assembly of the people (oenach). The land the tribe lived on belonged to the tribe and not the king. The land was owned by the tribe's noble families. The extended family (cineadh) was the basic unit. The family usually was four generations, grandparent to grandchildren. This family unit was known as the Iarfine. It expanded to include great grandparents (Infine) if they were living, and contracted to just a father and sons (Derbfine) if there were no other generations alive. Land did not pass to the eldest son when a father died, it simply remained a possession of the clan. Individual rights derived from family position. Celtic society was divided into three classes: The Nobles, the Freecommoners, and the Unfree. Each man had an honor price, which was dependent on his class and status within the class. This formed the basis for any compensation to his family for death, injury, or insult. The Noble class was made up of a sub-strata that included the warriors, specialists, master craftsmen, jurists, doctors, and men of learning [the bards and priests (Druids)]. The Freecommoners were peasant farmers and craftsmen of lesser ability than master craftsmen. The Unfree were degraded families, subjected communities and slaves. Women were given a high place in Celtic society. According to the marriage laws women controlled all the possessions they owned before the marriage, and could leave with them if necessary. If the woman's wealth exceeded that of her husband, she controlled the household. Wives frequently joined their men in battle. One of the most famous Celtic women warriors was Queen Boudicca who assisted in the burning of Rome in 60 A.D.
A Chief was a leader of his people, but there could be sub-chiefs under his authority. The Chief gave his allegiance to a king. A king could be an "over king" meaning other kings paid him honor, in turn the "over kings" were subordinate to a "high king" (ard ri) if one could rise to subordinate his peers. (The Irish hierarchical social system paralled British and Continental aristocracies with kings, dukes, and earls/counts.) Celtic law, however, held that only the king could rule his people, no 'over king' had direct power over a lesser king's tribe or area. Celtic law was based on custom and not by enforcement from autocratic authority. The family was guided by legal specialists called brehons who interpreted the law for their family. The Celts hated the German invaders who imposed a state-enforced legal system. Poets were very important in Celtic society, there was a whole range of titles a poet passed through before he was called the highest title (Ollam). An Ollam was considered on a level with a petty king. A poet's function in Celtic society was to praise and eulogize his Chief and the Chief's family. The poet preserved and recited the Chief's genealogy. A poet had the right to travel and provide the service to other Chiefs for which they must pay a fee. In fact the Chiefs so visited were obligated to play host to the poet and his retinue, sometimes as many as 24 people for an Ollam. 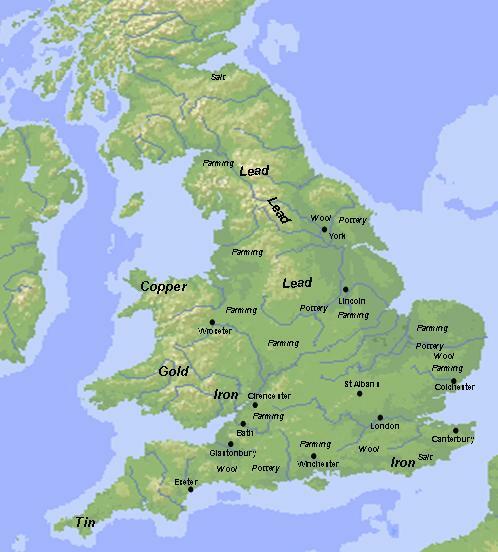 Tribal Britons and a surprising number of continental tribes thinly populated pre-Roman Britain. Life was slow and tied to farming. The Celts had established themselves as masters over the prior 500 years and iron was king in Britain. The Celts had occupied much of Europe and a Celtic tribe had sacked Rome in 386 BC. The Romans wrote most of the historical record of what we know about the Celts as internal Roman propaganda, and their sources are not entirely reliable. In the last century BC, inter-tribal fighting had weakened the British Celts and Caesar's timing for an invasion was perfect. Celtic clans were bound into tribes, each of which had its own social structure and customs, and possibly its own local gods. The British Celts lived in small hamlets of timber huts made with wicker walls and thatch roofs. British Celtic land was communal, and wealth seems to have been based on cattle. Women were near-equals of men, they owned property, and could choose their husbands. There was no written Celtic language, and poets passed an oral tradition. Druids were the priests and priestesses who administered Druidism, the religion of the Celts. Little is known of the Druids, because of their non-written records and secrecy. History and information were passed on verbally and memorised. 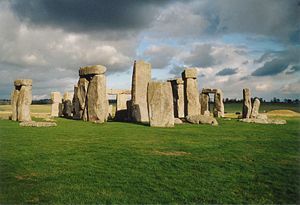 Caesar thought that the Druids originated in Britain. The Irish kings were always accompanied by Druids. Christianity opposed and finally killed druidism as a major religion. Groves of trees and other natural places were often held to be sacred. The Celtic druids were a complex combination of priests, political advisors, teachers, healers, and arbitrators. Druids had their own Celtic universities, where traditional Celtic knowledge was passed on by rote. Druids had the right to speak ahead of the king in council, and may even have had authority over the kings. Druids were ambassadors, they wrote poetry and songs, and they upheld tribal law. The Celts' religious ceremonies were usually in groves of trees, near sacred wells and springs. Human sacrifice may even have been part of Celtic religion. There are Roman stories of Celtic warriors cutting off their enemies' heads in battle and displaying the heads as trophies: whose propaganda story that was is uncertain, certainly psychological warfare was used by both sides. The Celts loved war and dressed fiercely, sometimes even going into battle naked, dyed blue, and screaming to terrify their enemies. Some chiefs had golden shields, breastplates, ornamented helmets, and trumpets. They also used chariots in battle as a mobile platform from which they threw spears. The chariots were maneuvered quickly to a weak point in the enemy line and were then quickly launched into an attack. The warriors often brought their families to watch their battles, and the families themselves, by yelling and distracting, created much confusion. Sadly for the Celts the Britons didn't stop fighting each other long enough to coordinate their fight against the Romans, or even the later Germans and Danes. Celtic selfishness cost them Britain. The Britons were never the same. The Britons gained much from Rome, contributing auxiliary soldiers in return and providing strategic food and minerals to the Empire. Britons improved their civilisation, built a national identity, became soft and dependent on Roman power, and lost their capacity to defeat the German invaders. When the Romans left Britain's world collapsed - albeit slowly. Roman stability and culture evaporated. A Germanic onslaught by invading Angles, Saxons, Jutes, and Franks lasted over 200 years; the Germans were then followed by the Vikings. The native Celts were absorbed, killed, squeezed into the corners of Britain, or migrated to the continent and Brittany. The remnant Britons were then called foreigners in their own land! Nonetheless, the invaders too were absorbed and became Britons in their turn. How did the Roman army manage to conquer Britain and what was their legacy? What did the Britons teach the Romans? What made the Roman legions invincible and who built those roads? What happened after the Romans left and when and how did Britain become England? Who were the native Britons and how did they and the invading Germanic tribes form a new Saxon world? Where did we come from? How did our English language evolve? Who were the architects of the peaceful land, which met the Normans? What role did they play and who were the peacemakers? I try to address these questions in the following essays. 1 See Humanities Web, The Anglo-Saxon Chronicle, The Chronicle BC 60 - AD 410 at, http://www.humanitiesweb.org/human.php?s=s&p=l&a=c&ID=1908&o=. 2 Adapted from Grahame Clark, World Prehistory, In New Perspective, pp. 131-132, 188-209; and Charles Thomas, Britain and Ireland, Prudence Jones and Nigel Pennick, A History of Pagan Europe, Peter Ellis, The Celtic Empire, Peter Laslett, The World We Have Lost, Peter Heather, The Fall of the Roman Empire, and Nora Chadwick, The Celts. See also BBC report, "'Signs of earliest Scots unearthed", http://news.bbc.co.uk/2/hi/uk_news/scotland/glasgow_and_west/7992300.stm, dated 9 April 2009. The latter documents an archeological find of hunting flints dated to c12000 BC. 3 See BBC reports by Paul Rincon, "'Delving deep into Britain's past", http://news.bbc.co.uk/2/hi/science/nature/5392134.stm, dated 1 October 2006, Professor Chris Stringer, " Piltdown's lessons for modern science", http://news.bbc.co.uk/2/hi/science/nature/6054656.stm, dated 16 October 2006, and Jonathan Amos, "Britain's human history revealed", http://news.bbc.co.uk/2/hi/science/nature/5317762.stm, dated 5 September 2006, Jonathan Amos, Megaflood 'made Island Britain', http://news.bbc.co.uk/2/hi/science/nature/6904675.stm, dated 18 July 2007. For recent stone age findings see BBC report by Eleanor Williams, "Fight on to save Stone Age Atlantis", http://news.bbc.co.uk/2/hi/uk_news/england/hampshire/6928293.stm, dated 8 August 2007. 4 See BBC report "World's oldest building discovered", http://news.bbc.co.uk/2/hi/science/nature/662794.stm, dated 1 March, 2000. 5 See BBC News Report by David Whitehouse, "Woven cloth dates back 27,000 years", http://news.bbc.co.uk/2/hi/science/nature/790569.stm, dated 14 June 2000. 6 Recent flint tool discoveries have dated a human presence in Suffolk to c70000 BC. Jewellry has also been found in the Middle East c100000 years-old: See BBC report by Jonathan Amos http://news.bbc.co.uk/2/hi/science/nature/5317762.stm, dated 5 September 2006; and also BBC report by Paul Rincon, " Study reveals 'oldest jewellery'", http://news.bbc.co.uk/2/hi/science/nature/5099104.stm, dated 22 June 2006. 7 See BBC report by Paul Rincon, "'Channel's key role in pre-history", http://news.bbc.co.uk/2/hi/science/nature/5352430.stm, dated 16 September 2006. 8 See BBC report "Filling in Missing Britain", http://news.bbc.co.uk/2/hi/science/nature/1565002.stm, dated 26 September 2001. Detailed archeological research is being made to learn about the past 500,000 years of human life in Britain. 8A See BBC reports by Paul Rincon, "Neanderthals 'were flame-haired'", http://news.bbc.co.uk/2/hi/science/nature/7062415.stm, dated 25 October 2007; and by James Morgan, "Neanderthals 'distinct from us'", http://news.bbc.co.uk/2/hi/science/nature/7886477.stm, dated 12 February 2009. 9 See "Rock of Ages", British Archeology, Issue 78, September 2004, at http://www.britarch.ac.uk/BA/ba78/feat3.shtml. See also BBC report " Excitement at Neolithic site find", http://news.bbc.co.uk/2/hi/uk_news/england/tyne/4399194.stm, dated 2 November 2005. 10 It has now been estimated that the stonehenge work required 1.5-3 million man-hours of work. However, the men involved required only basic engineering skills, levers, ropes, log-boats, and considerable organisation. Apparently both the men and stones came from Wales. See BBC report, "Stonehenge builders' houses found", dated 0 January 2007. 11 See 'The Stonehenge Lasershow', British Archeology, Issue 73, November 2003, at http://www.britarch.ac.uk/ba/ba73/feat1.shtml. 12 Ramon L Jiménenez, Caesar and the Celts, pps. 131-134. See also BBC Reports, 'King of Stonehenge' from Europe, http://news.bbc.co.uk/2/hi/uk_news/england/2746505.stm, dated 10 February, 2003; and by Siân Price, Stonehenge's huge support settlement, http://news.bbc.co.uk/2/hi/science/nature/7078578.stm, dated 5 November 2007; Stonehenge 'a long-term cemetery', http://news.bbc.co.uk/2/hi/science/nature/7426195.stm, dated 29 May 2008. 13 See BBC report by Dr David Whitehouse, 'Sci/Tech Facing up to the Stone Age', http://news.bbc.co.uk/2/hi/science/nature/511452.stm, dated 9 November 1999. 14 See BBC report by Peter Laverock, "Sci/Tech Seahenge gives up its secrets", http://news.bbc.co.uk/2/hi/science/nature/388988.stm, dated 8 July 1999; and BBC report by Philip Lingard, "Seahenge dated to spring 2050 BC", http://news.bbc.co.uk/2/hi/science/nature/544947.stm, dated 1 December 1999. 15 Lloyd Laing, Celtic Britain, pp.140-142. 16 See Charles Thomas, Britain and Ireland, pp. 44-53 for a discussion of the correlation of the evidence of Pit placenames, souterrain locales and 'symbol stones'. 17 The Picts left an incomplete Pictish Chronicle, see http://www.mimas.ac.uk/~zzalsaw2/pictish.html. 18 Lloyd Laing, Celtic Britain, p. 9. 19 The Celts called all Germans 'Saxons'. The terrible memory of these invasions lives on in the Scots' derisive term for the lowlanders and English - the Sassanach.